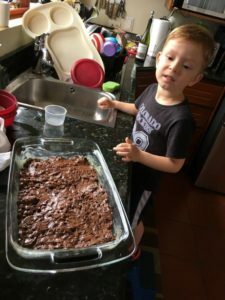 Today I made some really simple bar cookies with Older Boy. 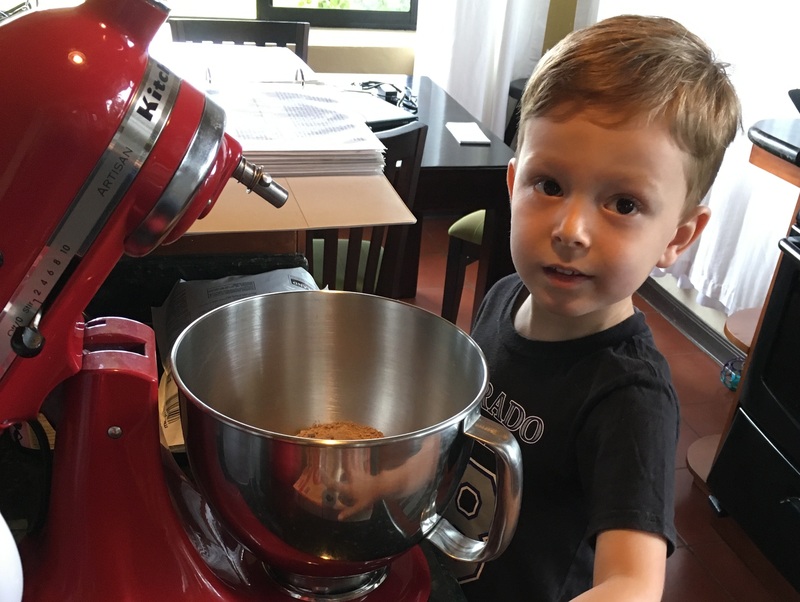 He was very enthusiastic to help me bake, and he kept talking about them for the rest of the day. This was a good recipe to make with a young kid since it’s super simple and doesn’t involve a lot of liquids or stuff that can spill. Of course, it does involve baking in a hot oven, though, so an adult should obviously help a child with that step. 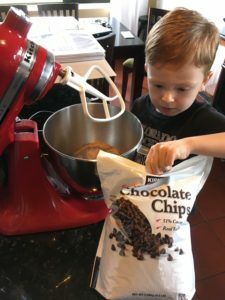 In any case, he enjoyed helping pour in the ingredients and turning the mixer on and off, and he seemed to have a blast! 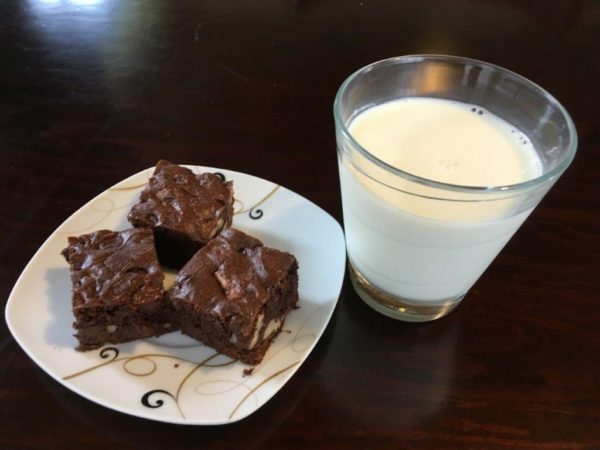 I got the basic recipe for these bar cookies from my mom, who got it from her friend Paula. These bar cookies are great because they use a box of cake mix, which takes care of all the dry ingredients. Then you just need to add a half cup of oil, two eggs, two tablespoons of water, and a 12-ounce package of chocolate chips. You can also throw in a half cup of nuts, which I’d definitely recommend. Then just pop it all into a 9×13-inch pan and bake at 350 degrees for about 30-40 minutes. The recipe called for just 20 minutes but when I checked at that point, they were definitely not yet done. The resulting bar cookies look like brownies but are drier and a bit crunchy, so indeed they’re more like a cookie. In fact, these turned out a tad dry for my taste, so the cake mix package may have been a bit larger than normal, or it might have needed more oil, butter, or water. I’ll put the recipe below, or you can find it on its own page here. If you end up making this recipe or any variation on it, let me know what you think. Happy baking! Mix everything together in a mixing bowl until blended. Pour into a greased 9x13-inch pan. Bake in a preheated oven at 350 degrees for around 30-40 minutes. Check after 25 or so to see if a toothpick comes out clean. When it does, they're ready. Cool, slice, and enjoy with milk and/or ice cream. It’s unusual that the cookies weren’t done after 20 minutes, but were almost dry by the time they were done. This might be the type of recipe that you don’t want to overbake. 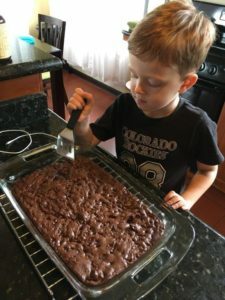 One thought…I usually use a 9×13 metal pan for this recipe and most bar cookies (usually “pan” indicates metal and “dish” indicates glass), and in many recipes, they suggest lowering your oven temperature 25 degrees if you use glass instead of metal. I don’t know if that would have made any difference in your bars. At least they still tasted delicious! Hi ma, and thanks for the comment! I’d say you’re probably right about both counts. I don’t have a good pan so I just used the glass dish (thanks for the clarification), plus our oven is really crappy so I think the temperature shot up for a few minutes after I put it in. So taking care of either of those factors probably would have made for a better end result. Actually, now that they’re in the fridge, I think they taste even better since they’re all nice and cold. That’s maybe just my preference, though! Good pan/dish tip above! I love, love my glassware, but it really does produce different results than metal. I have a bread recipe that I always divide into multiple loaves, some in glass and some in metal. The glass-baked ones always have a lovely firmer, darker golden crust than the metal-baked ones, which kind of have a sort of temporary gumminess on the surface when they first come out of the pans. For me I find humidity makes a huge difference in baked goods, too. 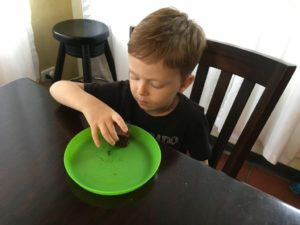 A dense soft-bite cookie recipe that worked just fine for my mom or grandma in their climate will spread to crunchy and thin in mine. 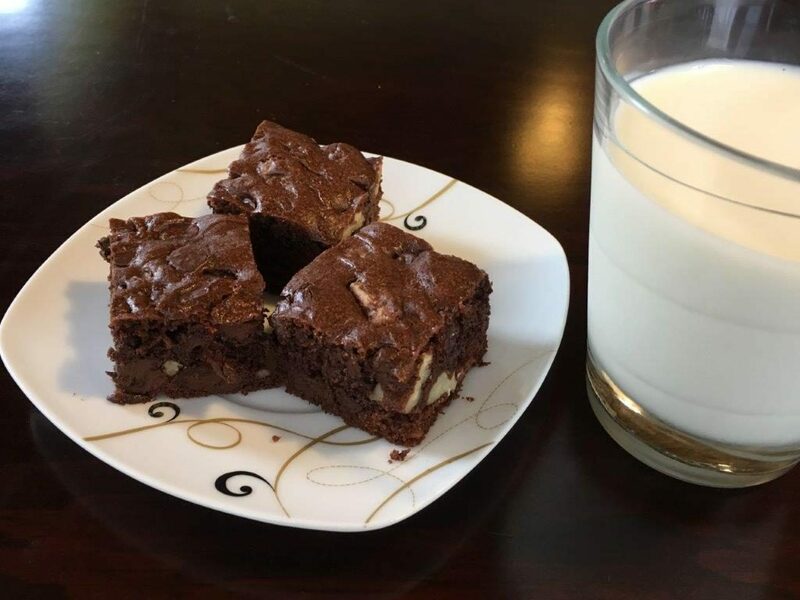 It wouldn’t easily solve your bar/brownie difference, but for drop cookies, I always end up either adding another cup or more of flour, or reducing butter by up to a quarter, to get the same texture here as I would in a drier climate. Thanks for the comment! I’ll have to experiment a bit more and keep those tips in mind. I’ve just made several kinds of Christmas cookies and they all came out pretty well, but I always seem to have to bake them about 20% longer than the recipes indicate. I guess that might have to do with the altitude here in Costa Rica or even in Colorado, but the humidity is wildly different in those two places. Anyhow, it’s funny because baking is basically chemistry with food, and I hate chemistry, but I love baking. I’m much more confident when baking something as opposed to cooking it on a stove or another way. Maybe that’s because recipes are essentially formulas that I can follow. And it’s also a good reason why I don’t experiment when baking. Wow, this is getting philosophical! 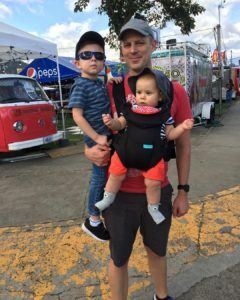 Thanks again for the comment and for reading the new(ish) blog!